For more than 55 years, Material Transport has been providing excellent and reliable service to businesses requiring transportation of their goods. Throughout the western U.S and British Columbia, MT is commited to efficiently and safely transporting your products. Our experienced and friendly dispatchers will take charge of your freight needs. Our expert staff works with you to transport your products efficiently, safely and on time. We run late model, reliable and CARB compliant equipment. Loads are monitored using electronic logs, enhancing safety and enabling location tracking. Upon delivery, you can rely on proof of delivery and accurate billing. We are the hauler of choice for multiple west coast companies; we'd like to become your hauler of choice, too. Our drivers enjoy weekends at home-not 34 resets common in the industry. Due to the nature of our business relationships that create constant demand, our trucks are on the road all year long. All maintenance is completed on weekends to avoid driver and vehicle down time. Class A drivers, grow your career in a supportive, family environment with excellent benefits, including quarterly safety bonuses. 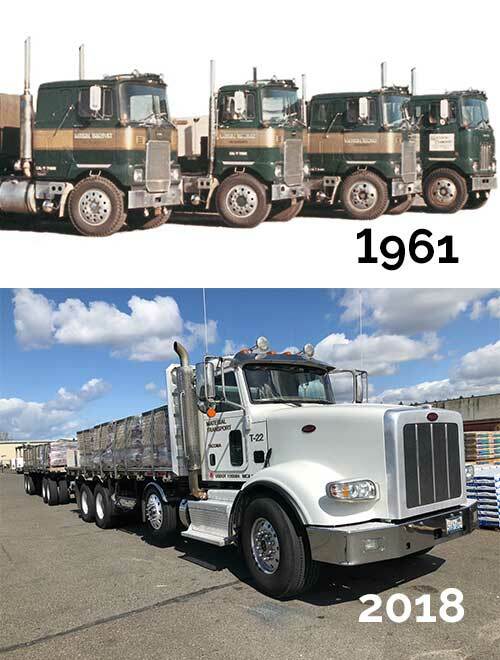 Founded in 1961 with a single truck, Material Transport now operates more than 50 power units and a variety of trailers designed to move products to and from locations throughout our subsidiary companies and beyond. Material Transport's territory ranges from Arizona to British Columbia and all the states in between. By continuing to monitor trends in long-haul trucking and implementing best practices, we strive to ensure that every load is delivered safely, efficiently and on time.